There’s just over three weeks to go until Portsmouth welcomes its first Comic Con to the Guildhall on 5th and 6th May, and the stellar line-up of guests and the range of family activities are not to be missed! Organised in collaboration with Tripwire Magazine, Portsmouth Comic Con will offer the best in comic, film, TV and pop culture entertainment in the largest event of its kind in the South. Some of the industry’s greatest international artists and writers will be in attendance. Their work has influenced some of the biggest box office draws like X-Men, Black Panther, Thor, Avengers, Batman, Superman, Star Wars, Doctor Who, Hellboy, Kingsman and many more. The show also features the talent who have shaped the likes of Game of Thrones, Ready Player One and The Grand Budapest Hotel. There’ll be opportunities to hear them speak, get their autographs and take a behind the scenes look at the way they work. There will also the opportunity for celebrity signings with Josh Herdman (Gregory Goyle in the Harry Potter films) and Red Dwarf cast members Mark Dexter (Howard Rimmer, brother of Arnold) and Norman Lovett (Holly). More will be announced in the run-up to the event. Comic Con will be celebrating Superman’s 80th birthday with an exclusive exhibition of images, from his first appearance in Action Comics #1, taking in the Golden and Silver Age, right up to the present day, with art by comic book superstars including Neal Adams, Alex Ross, Frank Miller, Frank Quitely and many more. 2018 is a milestone year for DC’s flagship character, as Brian Michael Bendis takes over Superman and Action Comics, and the publication of Action Comics #1000 this April. In the Virtual Reality Zone, you can discover VR, motion capture, screenings, game demonstrations, robots and more as the University of Portsmouth showcases state-of-the-art technology and emerging student talent. Try out your light sabre skills at the LED Sabre Training School and Silver Sabres’ interactive VR and Motion Capture demonstrations. There’ll be a hover bike game; a survival RTS student game demo; Nao, Artoo D2 and spider robots; as well as the opportunity to make block robots, and more. Retro gaming is the order of the day in the Interactive Zone thanks to Portsmouth’s video game café, Game Over. They will be providing the ultimate retro-gaming experience with more than 1,500 classic games from the 80s and 90s to play on a selection of twelve designated arcade machines and nine fully-equipped consoles from Vectrex to the Game Cube. The Interactive Zone will be open for the duration of Comic Con and is completely free to play. It’s suitable for all ages and has 2, 3 and 4 player games. If you prefer your gaming to be more hands-on, then join Games Workshop for high-quality, fantasy wargaming miniatures, which you can collect, build, paint and play with. Games Workshop offers building, painting and gaming tutorials, and will be on hand to discuss the rich backgrounds of the gaming worlds at Comic Con, Warhammer: Age of Sigmar and Warhammer 40,000. Age of Sigmar is set across eight magical realms, creating mighty battles in an age of unending war, while Warhammer 40,000 is set in the war-torn future of the 41st millennium, and sees humanity defending its empire against both traitors and aliens. If you want to see how a Doctor Who monster is created, then come and watch the live FX demonstration. Gary Pollard is a revered industry sculptor of 30 years’ standing who rarely appears at events. His career as a sculptor started on the cult classic Labyrinth in 1983, and since then he has been a key sculptor on Star Wars: Episode I, a creature designer on The Mummy, an animatronics modeller on Little Shop of Horrors, a designer on The Never Ending Story III, head of sculpture on The Hitchhiker’s Guide to the Galaxy, supervising and key animatronic designer on two Harry Potter movies and prosthetic make-up designer on Mortal Kombat: Annihilation, to name just a few. His work includes prosthetics for Game of Thrones and sculpture for Doctor Who. At Comic Con, Gary will be demonstrating how to create a Doctor Who monster or alien, and on both days, he will start with a 2D concept and progress to a finished-looking 3D representation of the chosen character by the end of the day. There may even be an opportunity for children to get involved and have a go themselves. Comic Con is also taking over the streets of Portsmouth. There’s been a zombie Apocalypse in Portsmouth City and we need the superheroes of Portsmouth to help stop the invasion! James Waterfield (Lawn Of The Dead) will be running a Street Art Workshop where visitors can come and paint their own zombie or create their own superhero: they can also take them home afterwards. Portsmouth Comic Con has joined forces with Dirk Wood, Creative Director and co-editor of Full Bleed: The Comics and Culture Quarterly, to run a talent competition. Three artistic individuals will be given the opportunity to see their work published in future issues of the publication. During the Comic Con weekend, Dirk Wood will be looking for talent to be featured in future issues of Full Bleed, so bring your best creative skills and you could be in with a chance of having your work published in IDW’s prestigious publication. Artwork inspired by Stan Lee and created by Alex Ross, two of the biggest names in comic books, will also be on show. This exclusive exhibition, organised in partnership with Bournemouth’s Westover Gallery, will present a number of signed limited edition pieces from Stan Lee’s Marvel Collection and artist Alex Ross that Comic Con visitors can view and purchase. Also at Portsmouth Comic Con: the ultimate in board games with Dice, Portsmouth’s soon-to-be first board games café; cosplay competitions; a Steampunk deck and a series of panels hosted by some of the best and most experienced artists and writers in the comic industry. 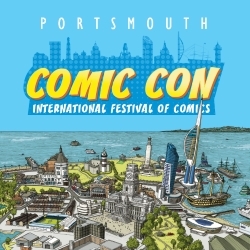 For all the latest goings on, check the website at portsmouthcomiccon.com.